Costa Rica is one of the more environmentally diverse countries on the planet. And thus the variety of outdoor activities you can do will blow you away. Surfing in the morning and hiking a volcano in the afternoon. Ziplining one minute and snorkeling the next. Finish up canyoneering to be taken to white water rafting. All of this is possible through Latitudes. We plan your adventure activities, provide your transportation and book knowledgeable tour guides who will make this the most memorable trip you have ever been on. If you would like more information please give us a call at 866.735.9115 and one of our adventure specialists will assist you. Rappel tropical waterfalls, hike & down-climb in an isolated rainforest canyon in Costa Rica near the Arenal Volcano. Canyoneering in Costa Rica is a brand-new sport that’s becoming very popular the world over! The rugged, mountainous terrain near the Arenal Volcano is ideal for canyoneering in Costa Rica. 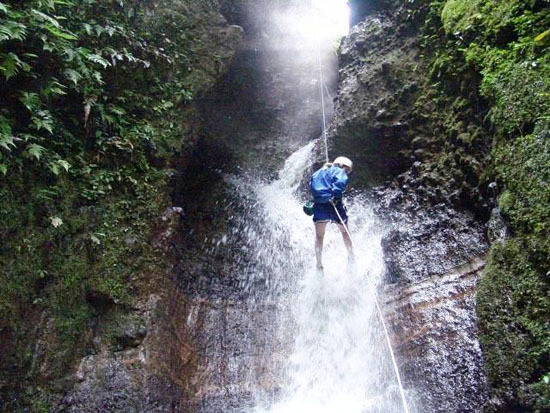 You’ll go rappelling, down-climbing, river tracing and descend huge, breathtaking waterfalls hidden in our Lost Canyon near the Arenal Volcano! Canyoneering in Costa Rica is more than just a waterfall rappel — it’s a very active and physical sport where you use your whole body to make your way down a beautiful river canyon and hike through deep Costa Rica rainforest. Picture yourself on one of the planet’s top white water rivers, paddle in hand, a gaze of triumph and excitement on your face, as you enjoy mile after mile of Costa Rica’s most mesmerizing rainforest environment. 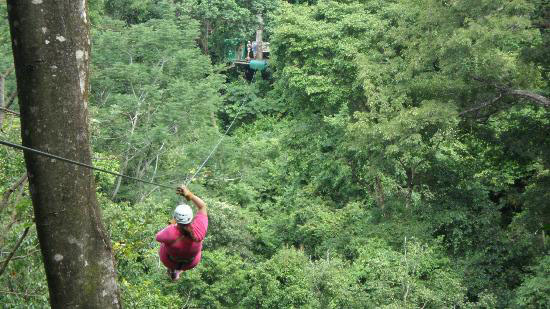 The Vista Los Suenos Canopy is a very contemporary tour; it was designed by Costa Rican guideswith more than 9 years of experience in conducting Canopy Tours. The main idea for this canopy tour was to give clients the adventure of their life, so a zipline was made with some of the longest cable runs in the Central Pacific area while maintaining safety. Thousands of vacationing families and friends have visited this tropical canopy adventure with shrieks of laughter and big smiles.